There’s a holiday candle workshop happening through Wave Hill in the Bronx on Sat, Dec 10, 2011. It will take place at Glyndor Gallery from 11 AM-3 PM. You’ll get to create a centerpiece around a candle in a terracotta pot using fresh greens, pine cones and other objects from nature. This would be a fun family holiday activity as children eight and older are welcome if accompanied by an adult. 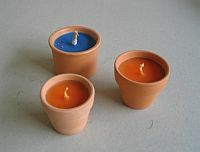 For more information on the Candles and Greens workshop, call 718.549.3200 or visit Wave Hill.